Japan has been dominating the news during the past week. The situation is obviously horrible, but how bad is it compared to other recent earthquakes? The following tree map shows the casualities in the worst earthquakes since 2000. The data is from USGS. For Japan I just took the latest estimate of people dead and missing from Wikipedia, although some suggest the number of casualties will rise to over 25.000. And we obviously have no idea where the story with those powerplants will end. 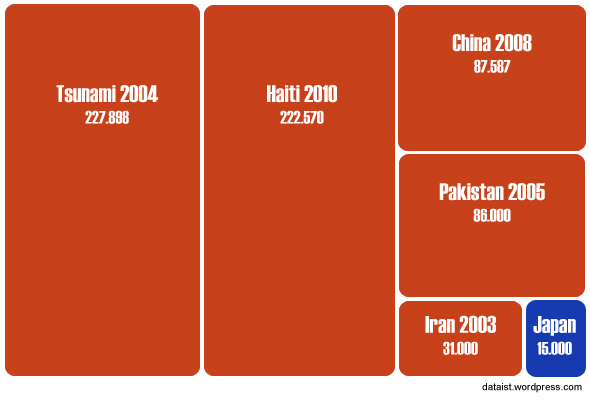 In any case, I think this visualization helps you to put at least the Asian tsunami and the Haiti disaster in some proportion. How did I do this? I used simply used the tree map gadget in Google Doc as a base and polished the result in Photoshop.